Your 30s are a great time to start bodybuilding. While you might be slightly apprehensive if you've never trained for bodybuilding or even done much in the way of strength training before, you're far from being too old to start. Bodybuilding doesn't have to take over your entire life, and it can be very beneficial. 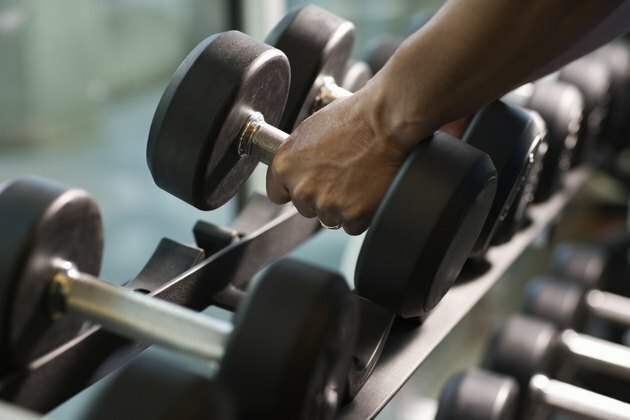 According to the Centers for Disease Control and Prevention, strength training can help you build muscle, lose fat, prevent injuries, strengthen your bones and boost your metabolism. The most important factor in bodybuilding is your training program. Many advanced bodybuilders train using split workouts, where they train one or two muscles groups each day and perform lots of exercises in a single session. However, this probably isn't the best way for you to start. If you've never completed a bodybuilding training program, start with a full-body program your first year. Train three times per week, and base your routine around basic free-weight exercises, such as squats, deadlifts, bench presses, dips, rows and curls. The next thing to look at is your diet. In order to build muscle, you need to eat more calories than you burn, but not too many, or you'll put on added fat. You can use an online calorie calculator to determine your ideal weight. It takes your age, activity level, weight and fitness goals into account and gives you a recommended daily calorie intake. If you're in your mid to late 30s and work in a sedentary job, you'll likely need fewer calories than a teenager with an active lifestyle. It is also best to drink plenty of fluids and get your calories from healthy foods, such as meat, fish, fruits, vegetables, nuts and whole grains. The older you get, the higher your risk of injuries and joint problems. Getting stronger can reduce your risk of developing bone-related or joint-related ailments, such as osteoporosis or arthritis. Including single leg exercises, like split squats and lunges, in your training routine can reduce your risk of knee injuries, while performing exercises for your rotator cuffs will make your shoulders healthier and stronger. The bodybuilding lifestyle requires you to adhere to a strict regime that requires you to eat healthy foods, get adequate rest and exercise daily. It may be difficult to train around your work, family and social schedule, but it is possible. Your new diet can also fit into your lifestyle easily. Prepare your meals in advance, and have a supply of healthy snacks handy at work. Don't beat yourself up if you relax your diet a little bit on weekends or when enjoying time with your family.